Spain's players and coach have criticised the new football that will be used in Euro 2004. The official ball for the tournament was used for the first time in Spain's 2-1 friendly international win against Peru on Wednesday. Spain coach Inaki Saez and several players were unhappy with the Roteiro ball manufactured by Adidas. Saez said: "As it has no seams it behaves very strangely. It's horrible, difficult to control and to pass." David Beckham, sponsored by Adidas, was involved in testing and liked the ball. But his Real Madrid team-mate Ivan Helguera said: "It's like a beach ball. I don't like it at all. To send it where you want you really have to hit it hard." 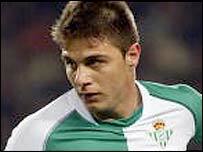 Real Betis winger Joaquin added: "It's hard to believe they can call this a ball. It lifts a lot and doesn't follow a true line."